JMI Admission 2018- Jamia Millia Islamia is one of the top 5 public central universities located in New Delhi, India offering various undergraduate, graduate, and postgraduate courses. The university was established in the year 1920 and became a Central University by an act of the Indian Parliament in 1988. JMI Admission in various graduate and postgraduate programs (Except few courses) is done on the basis of entrance test conducted by Jamia Millia Islamia every year. JMI has many departments under nine faculties, scroll down for the list of Departments and faculties. JMI aims at creating new knowledge, acquiring new capabilities and producing an intelligent human resource pool for the promotion of economic growth, cultural development, social cohesion, equity and justice. 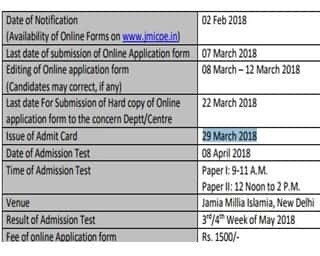 The complete list of the main courses is given in the following table, followed by details on JMI admission to the most popular regular courses offered by Jamia Millia Islamia. The test centres for the Entrance examination in India are Calicut, Delhi, Guwahati, Lucknow, Kolkata, Patna and Srinagar. 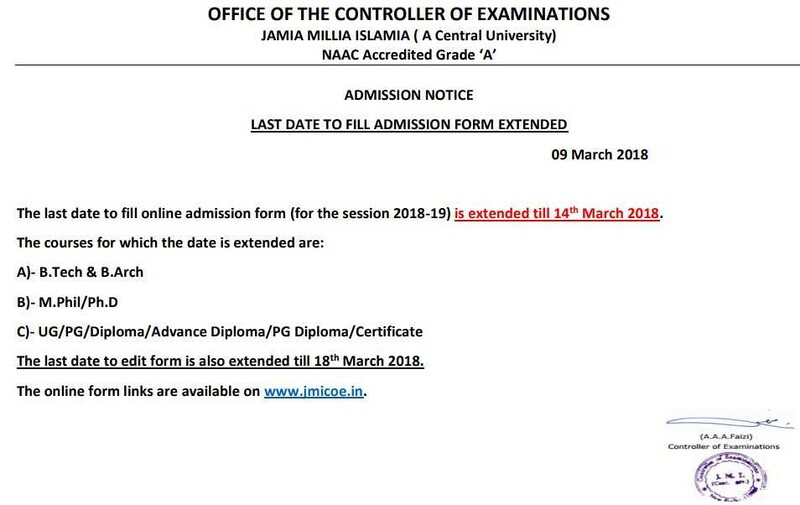 Latest Update: The last date for the application submission for al UG/PG/Diploma courses including BTech and BArch has been extended to 14 March 2018, And the last date to edit/correction of the JMI application form has been extended to 18 March 2018. Last year more than 1,50,000 applications were received by the Jamia Islamia University for admissions to its undergraduate, postgraduate and diploma certificate courses. Of the total number of applicants, 15,000 sat for tests at centres outside the capital. Students were seen more interested in the admission in engineering, mass communications, human resource management, master of social work, dentistry and fine arts. Now, the university has also added physiotherapy to the list. Jamia conducts entrance exam for all the courses except for MBBS, BDS and Architecture. Jamia BDS admission would be based on NEET UG Score and B.Arch admission would be based on NATA score. All the students who are interested in Jamia BDS/ B.Arch Admission have to fill the Jamia application form before the due date. 12 programmes to prepare professional teachers and teacher educators. M.Phil. & Doctoral programme in Education. B.A. LL.B. (Hons. ), LL.M. and Ph. D.
JMI B.A. (Hons) English is one of the popular graduate programs under the Department of English at Jamia Millia Islamia University. The candidates can get admission in 3 years full-time JMI B.A. (Hons) English on the basis of entrance test conducted by JMI. The candidates passed in class 12 with minimum 50% are eligible to apply for admission to the program. The candidates are selected for interview on the basis of their performance in entrance test. The application form will be submitted through online mode. The entrance examination will be of total 100 marks 40 marks for objective type question and 60 marks for Descriptive type Question. The question will be asked from class 12 syllabus. There is negative Marking of 0.25 marks for each wrong answer in the Objective Type/ Multiple Choice Questions. Faculty of Law at Jamia Millia Islamia University invites application for the admission in their five years full-time B.A. L.L.B (Hons) program. Every year total 80 students get admission in the program on the basis of Entrance Test which is conducted by JMI. To get admission to B.A. L.L.B (Hons) program at Jamia Millia Islamia, the candidates must have passed Class 12 /Sr. Sec. School Certificate/ or equivalent in any discipline from a recognised Board. The candidates are finally selected for admission in the program on the basis of Interview and Entrance Test. The candidates can submit the application form through online mode. The entrance examination will be of total 100 marks, and the questions will be related to General Knowledge and Current Affairs. Negative Marking of 0.25 marks for each wrong answer in each question. Jamia Millia Islamia BDS Admission is done on the basis of NEET scores. JMI dental college which is under the Department of Dentistry at Jamia Millia Islamia offers five years full-time BDS program. To be eligible for admission to the program the candidates must have passed class 12 with subjects such as Physics, Chemistry, Biology and English with minimum 50% marks in the subjects concerned. Submission of the application form can be done only through online mode. The total number of seats in the program is 50. Total marks of the entrance examination 200 and the candidates will be given 3 hours. There is no negative marking for the wrong answer, and the question will be asked from class 12 syllabus. Total marks of the entrance examination 100 and the candidates will have 1 hour and 45 minutes during the examination. The question will be asked from class 12 syllabus and negative marking of 0.25 marks for each wrong answer in the objective type questions. JMI MBA Admission is done through the entrance test conducted by JMI every year. The Centre for Management Studies under Jamia Millia Islamia offers three management programs such as 2-year full-time MBA, two years self-financed MBA (Executive) and two years self-financed MIB (Master in International Business). JMI MBA famous in India and the MBA students at JMI gets a high package of salary every year. To apply for appearing in the entrance test for admission in Management program the candidates should have completed bachelor’s degree with minimum 50% aggregate marks. The candidates will be selected for GD & PI on the basis of entrance test score. A total number of seats in full-time MBA program at JMI are 60, and the application can be submitted only through online mode. In case of any query regarding the JMI Admission 2018, you can write to us in the comment section below.